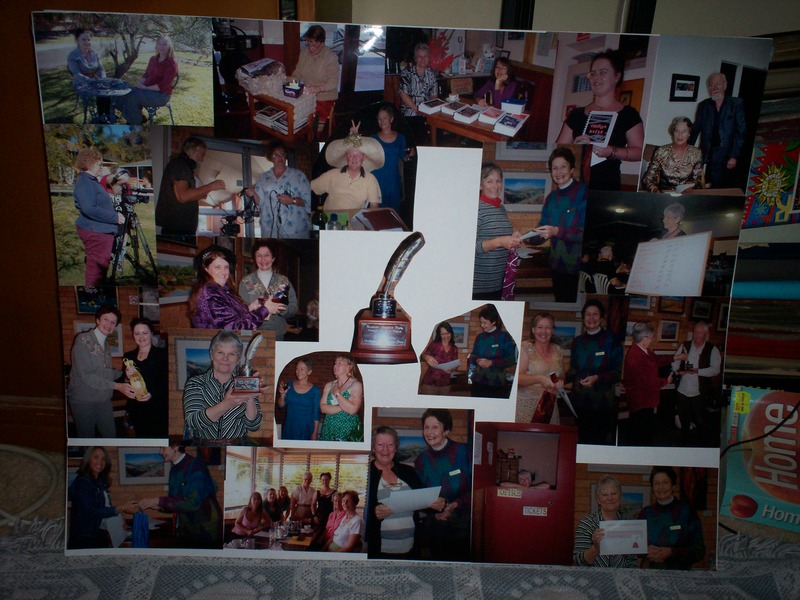 I picked up more photos today of the Nambucca Valley Writers’ Group 20th anniversary and anthology launch. 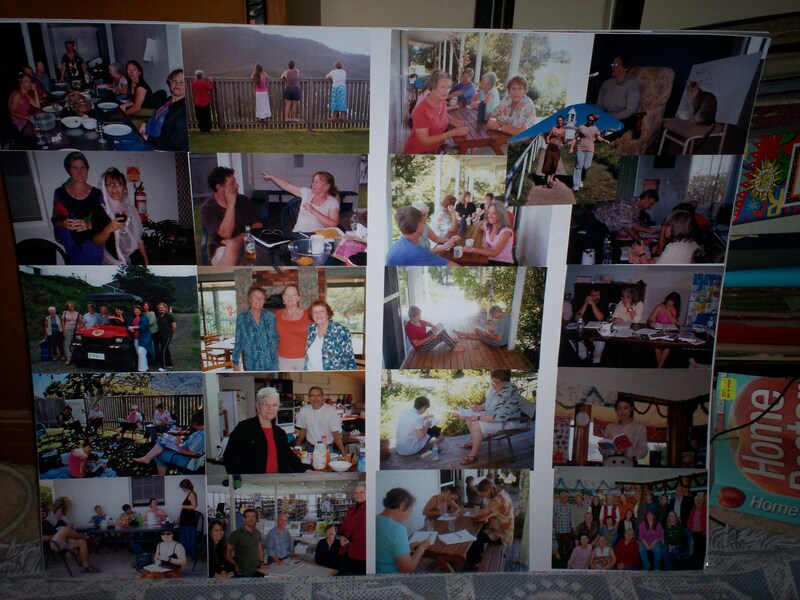 I had also taken photos of our Christmas party, and only one of those taken outside turned out. The rest of the negatives were blank. I have to face the fact that my old SLR camera is dying. It’s served me well, it’s been on a horse around the pyramids, a camel up Mount Sinai and a donkey from the Valley of the KIngs to the Valley of the Queens. That was 12 years ago, and now it’s telling me it’s had enough. So for a while I’m going to have to use my cheap little digital because I don’t want to spend money on another digital camera until I have enough to get a digital SLR, preferably with twin lens. And they cost a lot more money than I have right now. 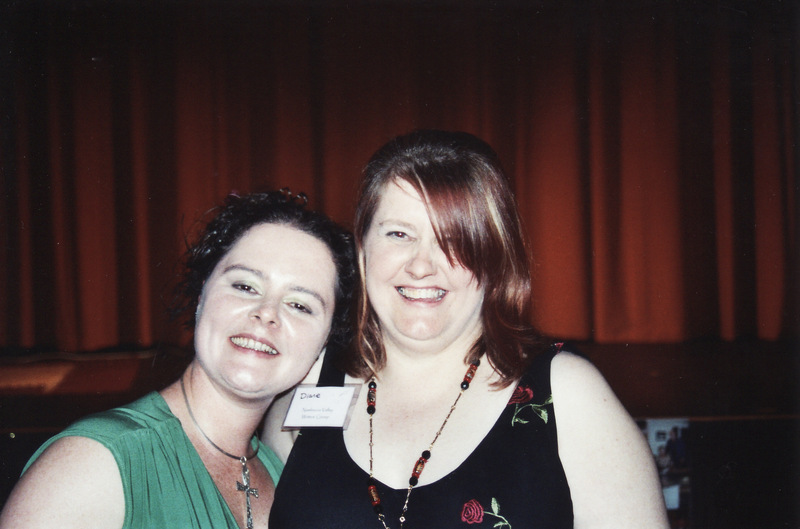 Here I am with my partner in collage, Jennifer, the prodigal poet who has recently returned to our group from Melbourne. At the end of the evening, we assembled as many of the writers group members as we could for a group photo. Note my legs, second from the right. A very rare sight. An even rarer sight are the killer heels – I don’t think I have worn these for at least three years. 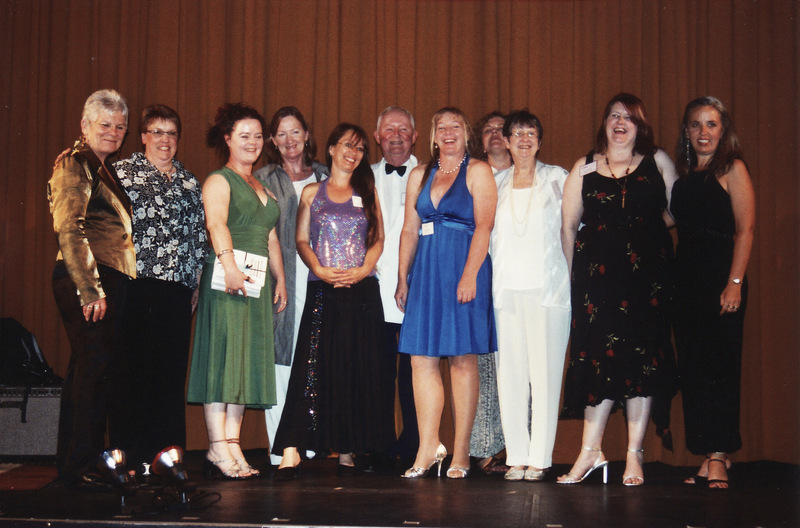 This is our executive committe, plus Gill, who’s a ring-in. 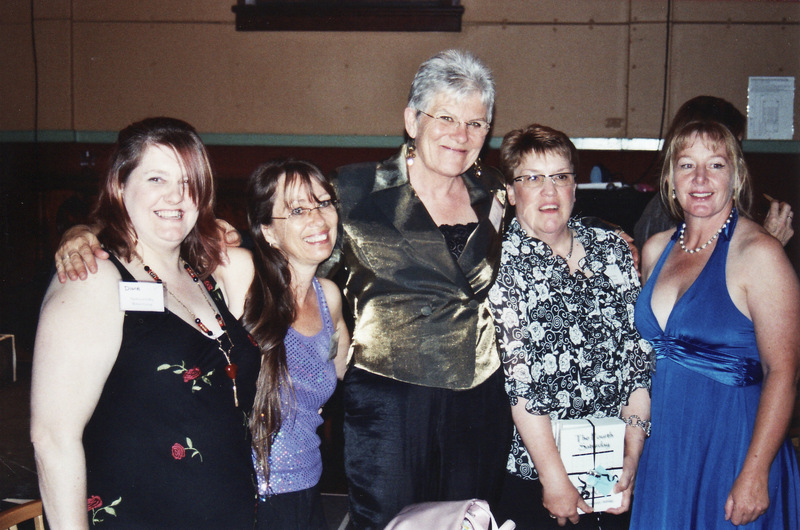 From left to right, we have moi, the Secretary, Roby, the President of Vice (and we still haven’t seen a lot of vice from her this year), Prez Caz (newest life member and mentor to us all), Gill (the ring-in, maybe she’s angling for a job on the committee), and Sue, our treasured Treasurer. This lovely photo of me was taken by Maggie (similar to the one that I’d already posted but this time I don’t have the anthology in my hand.) 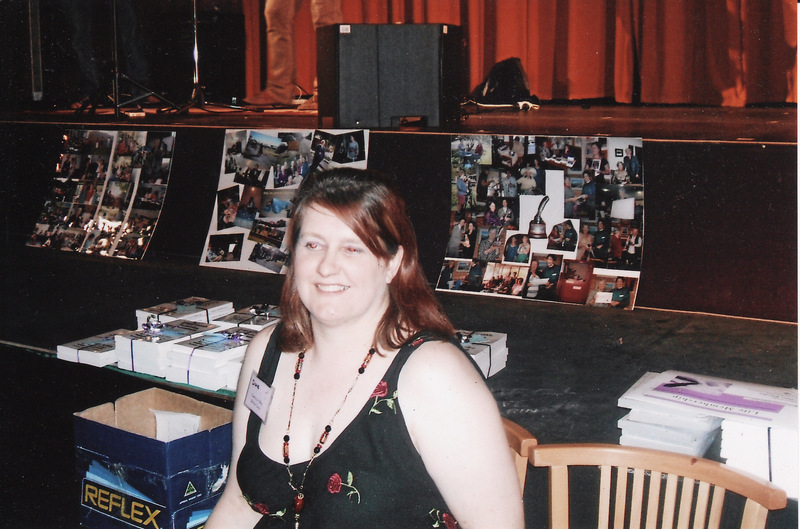 Behind me are a pile of our gorgeous anthologies, and the collages I prepared of the group. 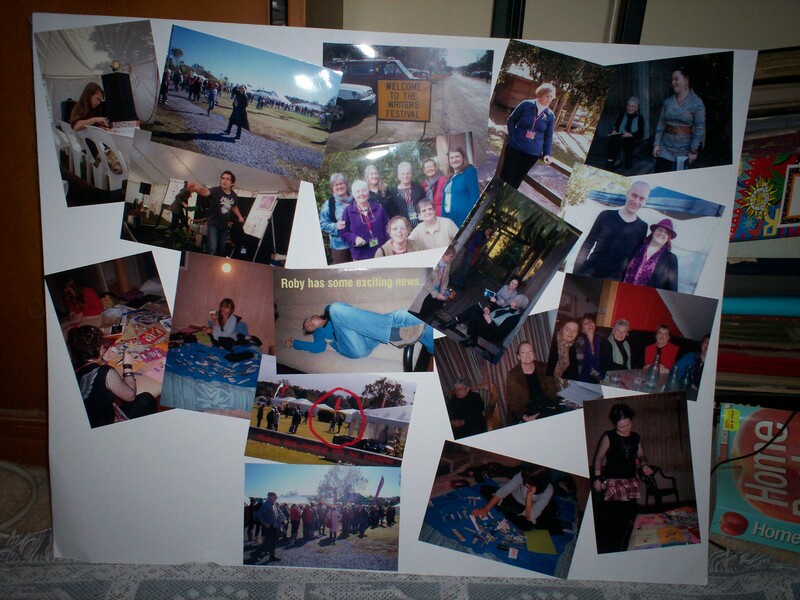 More photos of the launch are on the Nambucca Valley Writers Group blog. I’m still writing my Nanowrimo novel. 53,000 words and growing. It feels like coming home, especially as the main characters of ‘Making the Cut’, Chloe and Luke have shown up in the story, and I really like the way the relationship between Luke and Kirsty is developing in ‘Reality Check’ . Looks like he’s going to play a bigger role than I first expected. you’ve got one day to go!! thanks for dropping by, simmone. I’m doing a Nano “no-no” at the moment, reading back what I’ve already written.